← How to convert Excel to Postscript? 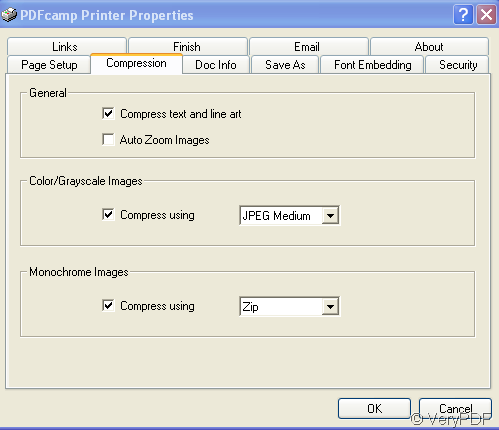 How to use JPEG compression for color image streams in PDFcamp Printer? The aim of Jpeg compression is to take full-color (and gray-scale) "real-world" scenes and reduce the file size of images for storage and transmission. While capacity and bandwidth have improved dramatically over the last decade, the increased size of images make Jpeg still relevant for digital camera users and websites. 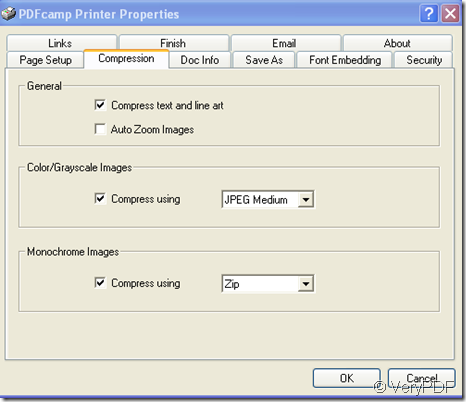 PDFcamp Printer can minish your file size through an important function in properties and I can show you how to use it. You can insert full-color or gray-scale images in your original file and press the hot key “Ctrl”+”P” or click “file”—“print”. Then click”properties” in which you should open the “compression” item to check compress use of “Color/Grey Scale Images” and select “JPEG Medium” in the combo box. At last you can click “OK” and save the new file in a location of your computer. The ultimate aim of using JPEG compression in PDFcamp Printer is to make the size of your pdf file smaller and smaller,which is easier to open,buffer,store and transfer.